It was all CW on Saturday - Men's Premier Action. Saturday saw a hat-trick of home wins for CW rugby. Action began on this glorious sunny day with the Premier Women at 11 a.m.! The ladies fielded a very strong group against what seemed like a fledgling Comox club. Comox continued to offer resistance to the very end, getting close on many occasions only to find errors thwarting them from crossing the line. On the other side of the coin, CW was almost flawless, stealing balls, running hard and finding the gaps and passing off to someone in a better position, more often than not, resulting in tries. CW players are improving greatly. 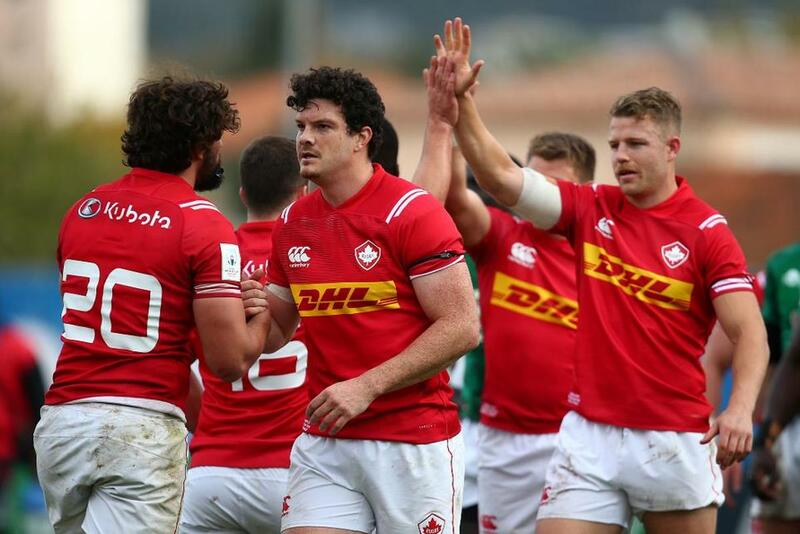 This was a convincing win with all players (24) getting plenty of time on the pitch and subbing in for Comox as well! CW had nine different try scorers, headed up by a brace from Julia Folk, Lizzie Adams and Nicole Shaver. Colleen Scott and Ashley Garnett managed their first tries for the season. Lizzie Adams had another solid game at #8, with strong, straight-ahead carries, clearing rucks and making solid tackles. Hazel Domingo has joined the team again this year from the Wanderers Club in Winnipeg. Hazell recently received Forward of the Year award from her ‘home’ club and we are very glad to have her back in the FRF. Everyone contributed on this day and it was a true team effort with players doing their jobs and supporting each other. All of this up and down encounter was handled admirably by M-i-M, Connor Klatt. The post-game merriment was obviously deserving for the women of the north. The Reserves followed and the visiting James Bay club got off to a good start, putting up first points with an early try. CW was awakened and they very soon replied to go ahead, 7 – 5 with the Sandner convert. James Bay added another to be deservedly leading at the interval. The flood gates opened in the second half with CW outscoring the Bays, 45 – 5! First it was Sandner who gained yards and fed to Hohert for the 14 – 12 lead. Next, Makaroff, after a good Kegode lead-up, 21 – 12. John Kirk, off the pines, widened the gap to 28 – 12. Next up, Captain Ilnicki was the benefactor of “coughed-up” ball, 33 – 12. Hohert crossed for his brace and 40 – 12 lead. Hyde-Lay entered the fray and scored one “pops” would have been proud of, scampering the length of the field and extending it to 45 – 12. Some defensive indecision occurred in the red zone after James Bay pressure and the Bay was rewarded, 45 – 17. Stalwart, Mikey Crawford crossed for the exclamation mark and the ‘half’, 52 – 17. For CW newcomer, Horton was a force with Hohert in the engine room and he earned the Fwd’s M-o-M from the Bays and Gareth Sandner was M-o-M in the backs. Horton was recognized by his mates as Hard Hat, well earned. Good win, Divvies. Thanks to M-i-M, Mike Moss and the AR’s. Next week will be a ‘tester’ – first road trip up against an undefeated, Meralomas to boot. The bitter taste of a semi-final loss from last season must still remain with many of the boys. Despite the massive differential on the comp ladder, having scored 296 points in six games, I see the Divvies as being in with a chance – go, you good things! Many call it the “Hundred Year War” no matter how you look at it this pairing always provides a battle! This one commenced at a lively pace with Dobravsky putting down an early stamp. The pressure from this field position enabled Logan to get close when Hall whipped a wide “miss”. JB earned possession and got out of jail with hard bursts from Thiel, White and Abdelmonem, effort which bore no fruit and it was the hosts again, with Finnemore just short on his thrust. Dobravsky piped up again and the early scrums demonstrated CW superiority with Wakefield mercurially getting a hand on the ball. Despite twenty minutes of quality possession and position, James Bay showed no signs of cracking, somewhat reminiscent of CW’s last match vs UV. Then it happened. From another shunted scrum, thirty five meters out, Hall dummied, turned on the burners and threw another wide “miss” to Schelly, on to Owen for first blood, 7 – 0 and the resultant enthusiasm of a packed House! Soon after, another scrum fragmented and the penalty yielded the second score. From 45m out, Schelly burst, fed Braddock, on to a deserving Dobravsky, out wide and Hall converted from a testy spot, 14 – 0. Thiel inspired his mates with two incisive breaks from the halfway, the forwards had a couple of cracks to no avail then ball came quickly to Thiel, Nieuwenhuysen drew the tackler and passed to Tough who scooted the final 15m and made it 14 – 7, around 33 minutes. JB was buoyed by the tally and when M.A. stole ball and CW was twice penalized, the James Bay lineout asked questions and when a third penalty occurred, the tie looked inevitable. We have seen The Tricolors get out of some fixes so far this season and this was to be another with the ball at mid-stripe in jig order and the threat snuffed. Stewart, Owen and Woolridge (earning a deserved ‘start’ after three weeks of precious cameos), all looked good but it was to be Braddock from the ruck who scored under the sticks with two minutes left. (Seems as if he is challenging Burger for the T-A-G title!) From the re-start, Finnemore made ground, then Dobravsky went for fifteen more and things looked like more of the same however a penalty against CW ended the half. The re-start saw CW miscue and lose possession and Bays fans instantly came alive. Despite the threat, someone made a play and Stewart stole the ball and was full-steam away from his own red zone. He sprung Adibe at the 22m and it took the outstanding pace of Nate Tough, coming from the other side of the field to haul him down, mere meters short and James Bay made sure there would be no try, winning the breakdown and booming the ball downfield. CW’s Dalsin and Adibe had minor brain eructions, moments they would rather forget, in their efforts to “make a play”! It was Dobravsky to break, yet again (this man was much more visible this week) and the ball came to Burger Thornber who dummied and almost created his own gap but he fed the Captain and Nate made it, no doubt, 28 – 7. To their credit, James Bay came back at the mid-point of the half for arguably, their most successful spurt in the match, M.A. and Thiel again making valuable yards. When CW was penalized, the Bays upped the ante and Abdelmonem was over after a good series of pick and goes for an ever so brief glimmer of hope for the men in navy. The balcony loved a hard JoMo run, Logan was held up, and Braddock went hard. It was wide ball from a scrum, courtesy of Hall, which found Owen who drew the defense and sent Adibe over, akin to the earlier Tough crossing and proof of the ball always beating the man, 33 – 12. James Bay did try to finish with some constructive attack all to no avail against a rock-solid defense. Kudos to M-i-M, Jamie Levchuk and his AR’s. This is always a difficult encounter to manage and he kept players on the field and interpreted matters accurately, in accordance with the laws. In a losing cause, Tieghan White ran well with ball in hand, de Goede and Wakefield had their moments but loosie, Abdelmonem was the money man in a pack that was sorely beaten in the sets and did not have gas in the tank when CW subbed a quality and total FRF in the second stanza. Josh Thiel at #10 had a solid game, Nieuwenhuysen and McAuley, on occasion made some ‘initial’ breaks and Tough was worth twelve points, scoring one and stopping a cert but Thiel gets my M-o-M in the backs. JB may have rued some missed opportunities but on the other end of the scale, the defense was very good. 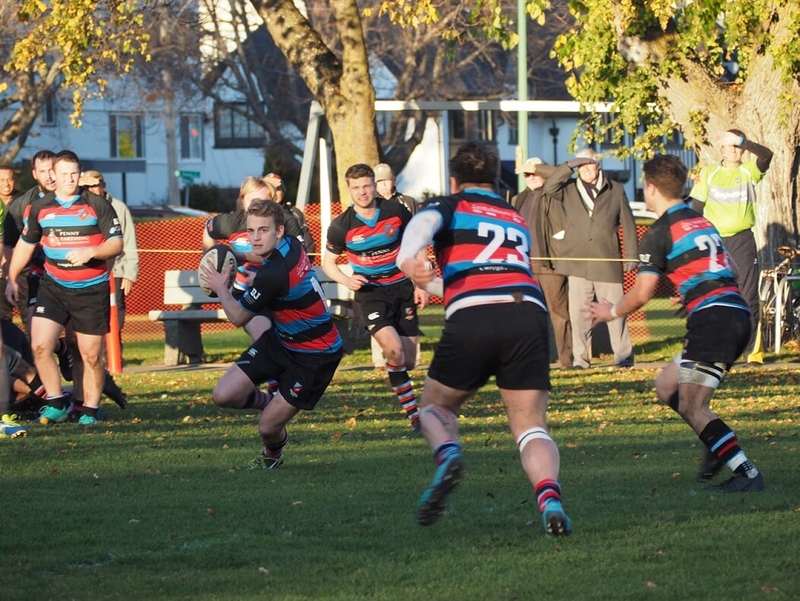 JB faces a very good Burnaby side on the road next week, so their task does not get any easier as the weeks pass on. As the saying goes; “the forwards determine who wins the match, the backs by how much”. Well it started with yet another total quality FRF performance, setting the platform, splintering and screwing scrums all day and de-energizing Wakefield’s potential effectiveness, as he frantically tried to create go-ahead ball. JB, Burger, Wooly, Herron, Sponarski and newcomer, Fawcett – all solid gold. The rest of the pack complimented the platform, Dawe earning the players’ Hard Hat and M-o-M, Stewart and Dobravsky asking questions with every touch. Throw a blanket over the backs – they were all pretty good most of the time, particularly at the tackle and with an ounce of luck could have posted more tries. I give it to Hall as my back’s M-o-M by a whisker however the Bays recognised Pitblado as M-o-M. CW takes its show on the road for the first time this season to the Lomadome next Saturday. The lads had better get used to this routine for the New Year will see most of their games “away”, a factor worth ten points to mainland and US teams. This group is definitely taking it one at a time and seem to portray no expectations beyond that. If they maintain that approach and continually work to get better, they will present a tough opponent to any team in the league. Thanks for a good day, you good things - unbeaten at seven! NSMT won a good one against Germany to start Saturday morning! The team played to their patterns and kept structure, a sign of a well-coached group. For those who have been semi or total naysayers, there was some crow to be digested with our eggs and bacon. I thought Phil Mack had one of his best games for some time and with the platform that was set by a hard-working group of forwards, led by Ardron, Baillie, Sheppard, Rumball and patterned on the work of the FRF – Moose Buydens, Raymondo Barkwill (boys who CW knows well) and Matt Tierney, it made the patterns easier to maintain. DTH, Sauder and Hearn were dope in starting (and finishing) roles in the backs. Despite this outstanding result, the job is still not complete and Hong Kong will be keen to live up to their pre-tournament ranking by the pundits on midday Friday (PST). Go, Canada! Gender counterparts played world ranked #2 England women tough in a 19 – 27 loss today. The women also have games ahead and we will try to feature some salient comments on their tour in coming days.